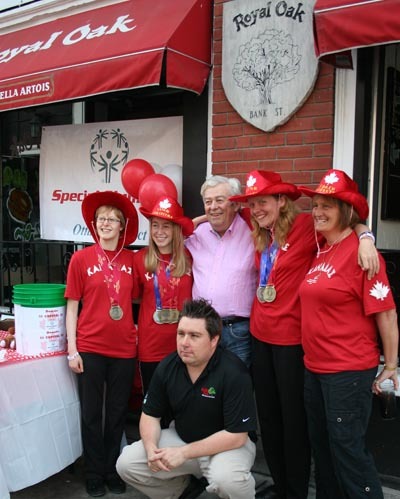 Generosity and community support were in full bloom at the Royal Oak on Bank St this past month, as one of Ottawa's most established pubs hosted a fundraiser and athlete send-off celebration. Event participants, including well known TV new anchor Max Keeping, enjoyed a BBQ party and excellent live music by local musician John Mathieu. Attendees had the chance to socialize with many Ottawa athletes, including three that are heading toward the 2011 World Games in Athens this month. Let's hear it for Marianne Scharf, Meagan Michie and Christina Judd Campbell! A big thanks to Regan Irvine and the staff of the Royal Oak for their dedication to making this month's fundraiser a great success!